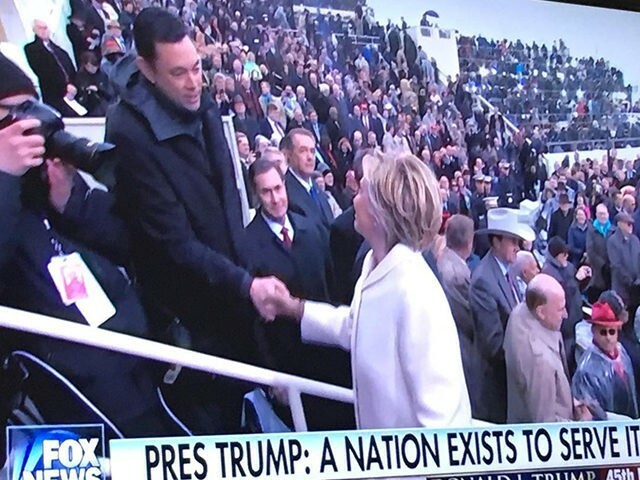 Congressman Jason Chaffetz, head of the House Oversight Committee, published a photo of himself greeting losing Democratic presidential candidate Hillary Clinton at Friday’s inauguration ceremony, teasing, “the investigation continues,” with no other comment. As House Oversight chairman, Chaffetz played a significant role in investigating Clinton following the revelation that she had used an unsecured private email server to save classified documents she came into contact with in her capacity as Secretary of State. Chaffetz has personally demanded an FBI investigation into Clinton, arguing that Clinton’s claim she was unaware of her breach of security protocol did not match the evidence the FBI had initially uncovered. Chaffetz was extremely critical of FBI director James Comey’s decision not to prosecute Clinton for her actions, and vowed to continue the investigation following Clinton’s defeat in the 2016 presidential election.